ATEM Television Studio HD Pro is the first live production switcher designed for both broadcasters and AV professionals. It includes 4 SDI and 4 HDMI inputs so you can connect up to 8 sources, and it supports all formats up to 1080p60! Packed with high-end broadcast features, ATEM Television Studio HD has re-sync on all inputs so you always get clean switching whether you’re using professional or consumer cameras. Plus, you get multiview output so you can see all of your sources, preview and program on a single screen, aux out, built in talkback, 2 still stores, an audio mixer, camera control unit and more! 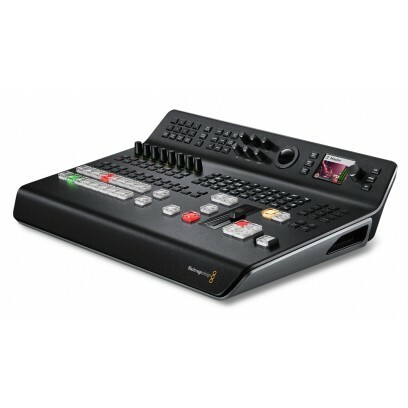 ATEM Television Studio Pro HD has the same features plus an integrated professional broadcast hardware control panel and additional CCU controls. Both models are perfect for live production, episodic television, web shows, AV or even live coverage of video gaming competitions! Simply plug in your cameras, game consoles or computers and start switching live! When you’re creating a live program from multiple cameras, it’s important to be able to see all of the video sources at the same time. The multiview output lets you see up to 8 channels of video on a single HDMI television or SDI monitor! You can see all of your cameras, tally indicators, graphics, preview and final program output all on the same display at the same time. Customize labels, see audio meters, set safe area markers, and more! Connect any standard HDTV to get perfect multi camera monitoring in any location!